The Last of Us went through a lot of revisions before settling on its final plot - including a major reversal of one of its main characters. We've already seen that The Last of Us could have had a very different ending, but it looks like the rest of the game's story saw some serious changes as well. If you haven't played the game, you should probably leave now - spoilers ahoy. Tess is introduced as Joel's partner and only real friend early in the game, and her actions go a long way in providing his motivation for joining Ellie on her journey. However, in an early version of the script Joel betrayed Tess, causing her to follow him across the country seeking revenge. 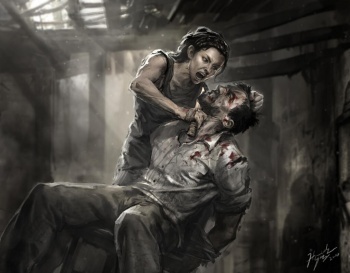 Eventually she would capture and torture Joel, and Ellie (who would have been more innocent, never having killed before) would shoot her to save Joel. Obviously, this isn't how things play out in the game. It was changed to make sure Joel had a compelling reason to travel with Ellie, and because the climax of that plotline was scrapped when Naughty Dog decided to make Ellie less gun-shy. "We decided it wasn't going to be about the first time she killed someone," says creative director Neil Druckmann, "it was more about this coming of age story of the impact that the horrors of violence has on her over the course of the game." Ellie instead found an opportunity for dramatic growth in David's villainy later in the game.